RAJSHAHI: Farmers have become happy over their newly harvested mustard seed yield in the region including its vast Barind tract in the current season, reports BSS. Talking to BSS here many of them said suitable climatic condition, high yielding varieties and modern technologies have supported them towards getting expected yield of the seasonal cash crop making them happy. “I had cultivated mustard on four bigha of lands and harvested six to seven mounds of seed per bigha on an average,” said Sabbir Ahmed, a grower of Bijoynagar area under Godagari Upazila. He used Barisharisha-14 variety which is high yielding than that of the conventional ones including Tory-7. Another farmer Bachhu Mian, 45, of Amnura area in Chapainawabganj Sadar Upazila, had brought three bigha of land under the cash crop cultivation. He got six mounds of yield after using Barisharisha-17 variety, another newly released high yielding variety. Sabbir and Bachhu, the two, among many other farmers, who have become satisfied with the harvested crop that’s acreage is gradually increasing in the region. 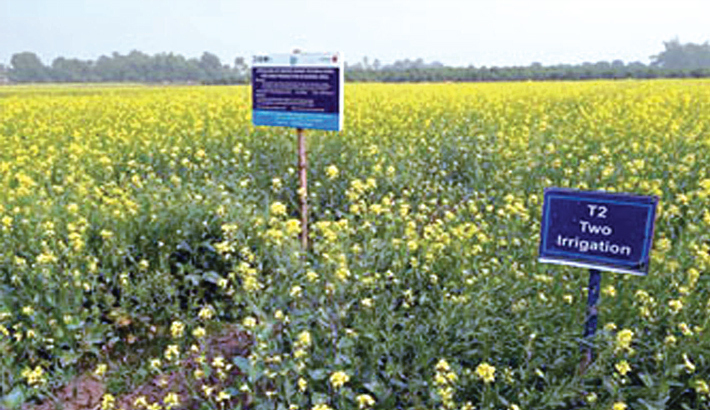 Bangladesh Agriculture Research Institute (BARI) has released 16 high yielding mustard seed varieties, Dr Shakhawat Hossain, Senior Scientific Officer of On Farm Research Division (OFRD), an organ of BARI, said. Farmers in the barind tract comprising Rajshahi, Chapainawabganj and Naogaon districts are seen cultivating two of those- BARI Sharisha-14 and BARI Sharisha-17 varieties for the last couple of years. But BARI Sharisha-14 has become popular for its bold grain, high yielding, yellow colour, oil extraction percentage high and less-water consuming characteristics, Dr Hossain clarified. The yellow colour mustard flower attracts many honeybees promoting honey hunting business in the region. OFRD’s Barind Station under its ‘Development of Four Crop-based Cropping Pattern in High Barind Tract project’ extends fertilizer, seed, pesticides and technological support to the farmers for promoting the two high yielding varieties. “We had established projection plots on around 70 bigha of land in the three districts this season,” Dr Shakhawat Hossain, In-charge of OFRD Barind station, said. He mentioned that the farmers were seen farming the cash crop on more lands after getting repeated bumper productions with excellent price in recent years adopting the “Short duration Aman rice-mustard-mugbean-short duration Aus rice” cropping pattern to reap high profits. SM Mustafizur Rahman, Additional Director of Department of Agriculture Extension (DAE), told BSS that mustard has been cultivated on more than 1.82 lakh hectares of land in eight districts under Rajshahi division. The farmers harvested more than 2.23 lakh tonnes of mustard seed from the farming fields this season. The landless and marginal farmers had brought vast tracts of the sandy char lands under mustard cultivation this time in the Ganges basins in the region. The vast char (riverbed) areas on the Padma, Mohananda, Boral, Ishamoti, Kartoa, Atrai and Jamuna and other existing rivers and their tributaries are being considered as suitable breeding grounds of mustard seed for the last couple of years. Agriculturist Mustafizur Rahman said the region has immense prospects to achieve self- reliance in oil seed production. He said the DAE and other agriculture related departments and banks extended need-based supports to the farmers for making the extensive mustard cultivation programme a total success this season. In this regard, he also underscored the need for using the latest agro-technologies and disseminating proper knowledge to the farmers for increasing mustard seed to achieve self- reliance in edible oil to reduce the dependence on import.